Production: Daiei Kyoto; black & white; running time: 94 minutes. Released 18 March 1956, Japan. Filmed at Daiei Studios in Tokyo. Producer: Masaichi Nagata; screenplay: Masashige Narusawa, from the short story "Susaki No Onna" by Yoshiko Shibaki; photography: Kazuo Miyagawa; sound: Mitsuo Hasagawa; art director: Hiroshi Mizutani; music: Toshiro Mayuzumi. Cast: Machiko Kyo ( Mickey ); Aiko Mimasu ( Yumeko ); Ayako Wakao ( Yasumi ); Michiyo Kogure ( Hanae ); Yasuko Kawakami ( Shizuko ); Eitoro Shindo ( Kurazo Taya ); Kenji Sugawara ( Eikoh ); Bontaro Miake ( Patrolman ); Toranosuke Ogawa ( Mickey's father ); Kumeko Urabe ( Otane ); Sadako Sawamura ( Tatsuko Taya ); Hiroko Machida ( Yorie ). Mesnil, Michel, Mizoguchi Kenji, Paris, 1965. Douchet, Jean, Connaissance de Kenji Mizoguchi , Paris, 1978. McDonald, Keiko, Kenji Mizoguchi , Boston, 1984. Andrew, Dudley, in Magill's Survey of Cinema - Foreign Language Films, volume 6 , edited by Magill, Frank, New Jersey, 1985. Yamauchi, Matsuo, "Street of Shame and Objective Depiction" in Eiga Hyoron (Tokyo), June 1956. Variety (New York), 25 July 1956. 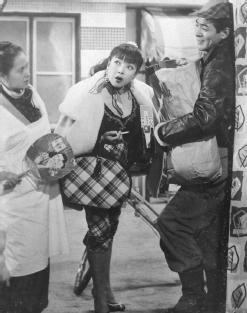 Takizawa, Osamu, "Watered-down Sake: Kenji Mizoguchi's Street of Shame" in Eiga Geijutsu (Tokyo), September 1956. Izawa, Jun, in Shinario (Tokyo), October 1956. Lane, John Francis, in Films and Filming (London), November 1956. Rhomer, Eric, "Rue de la Honte" in Arts (Paris), no. 642, 1957. Demonsablon, Phillipe, "Plus de Lumiere" in Cahiers du Cinéma (Paris), December 1957. Gillett, John, in Sight and Sound (London), Spring 1958. Gortori, Carlos, in Film Ideal (Madrid), January 1965. Tessier, Max, "La Rue de la Honte" in Image et Son (Paris), September 1980. Magny, Joel, "Le Testament de Mizoguchi?" in Cinéma (Paris), October 1980. Masson, Alain, "L'ordre du bordel" in Positif (Paris), November 1980. Burdeau, Emmanuel & others, "Mizoguchi encore," in Cahiers du Cinéma (Paris), July-August 1996. Everyone interested in Japanese film must be deeply indebted to Noel Burch's To the Distant Observer: Form and Meaning in Japanese Cinema —but indebted more for the questions his strictly formalist analyses raise than for the tendentious and problematic answers. At their root is Burch's antagonism to Hollywood and American cultural imperialism: films are valued or not according to their deviation from the shooting/editing codes of classical Hollywood cinema. As far as Mizoguchi is concerned, Burch's interest is restricted to certain films of the 30s and 40s; everything subsequent is dismissed. Street of Shame , Mizoguchi's last film, raises interesting questions about the relation between form and meaning: it reverts to the thematics of the 30s and 40s, realized in the stylistics of the 50s. Clearly well outside Burch's range of interest, it contains not a single shot that would be out of place in a classical Hollywood movie (while retaining the dominant characteristics of Mizoguchi's late period: fairly long takes, with much use of camera movement, depth of field, and much use of foreground/background simultaneous action). My own position is that a film should be evaluated not according to its formal devices (deviant or otherwise) but according to its totality: the richness and complexity of meaning that has been realized in the interaction of all its elements, thematic, stylistic, political. Street of Shame is the last in the series of impassioned feminist protests that (in forms varying sharply from period to period) traverses Mizoguchi's entire career as far as we can know it (many early films are lost). One may compare it, then, with two earlier films: Sisters of the Gion (1936, admired by Burch) and My Love Has been Burning (1949, ignored, hence presumably dismissed). The former is built upon a system of extremely long takes, mainly in long shot, mainly static, employing only one or two brief camera movements whose function is to hold us back from, rather than draw us toward, the characters. The latter also employs very long takes, often sequence-shots, but their function is entirely different: there is a great deal of camera movement, much less camera distance, and most of the scenes end with the camera leading us in toward the heroine, the scene embodying a lesson she has learned and that we share with her. The earlier film is built upon distanciation (there is no character with whom we can identify, we are to see all of them, male and female, trapped within and corrupted by a specific social system); the latter is built upon a subtle and beautifully realized form of identification, the heroine being an exemplary feminist figure whose progress toward a full awareness of the oppression of women within patriarchal culture we are invited to share. Street of Shame , rather than restrict itself to an imposed formal system, adopts the relative freedom and flexibility (within certain limitations, certain agreed or defined rules, without which communicative art is not possible) of classical Hollywood: the camera is free to move from character to character, position to position (so long as the basic rules are not shattered), in the interests of maximum expressivity. The result (common in classical Hollywood) is the achievement of a balance between distance and identification. We follow, over a period of a few months, the lives of five women working as prostitutes in a brothel in Tokyo's Yoshiwara district. All are presented with varying degrees of sympathy, but the constant movement among the various characters and plot-threads forbids full identification, leaving us a degree of freedom of judgment. That sympathy is not (or is only barely) extended to the male characters is a logical consequence of the rigorous and unrelenting way in which every manifestation of women's oppression is exposed. Hanae works to support her tubercular husband and their infant son; the husband (the least un sympathetic of the male characters) rewards her efforts to hold the family together by attempting suicide. Yumeko has resorted to prostitution to see her son through college; her reward is his shame and rage, and his total rejection of her when (entering middle age) she suggests they live together. Yorie leaves the brothel to marry, only to discover that her husband treats her as an unpaid servant; Mickey, outwardly tough, gum-chewing, westernized, is rebelling against a father who sees women merely as the adjuncts of "respectability" to aid his rise in the business world. When he visits the brothel to bring her home (he has married one of his numerous mistresses within months of his wife's death, and needs Mickey to reconstruct a family), her facade collapses and she expresses her vulnerability and rage, finally offering herself to him for money as the ultimate expression of contempt. Only Yasumi escapes the brothel, through a process of cultivating total ruthlessness, exploiting not only men but the women she works with in order to build up the capital she needs. The last minutes of the film introduce a new character, a teenage country girl whose father has become paralyzed after a mining accident. She is at first naively delighted by the food she is given, unlike any she has eaten before. The film ends with her night of initiation (replacing Yasumi, who has bought up a bankrupt clothing business). We watch her being dressed, groomed, made up, her innocent young face vanishing behind a mask of paint and powder. The film's devastating last image, and its only single-character closeup, has her hovering, terrified, behind a pillar, trying to find the courage to signal to her first prospective customer.